GREAT! AWESOME! MAGNIFICENT! The launch is really fun. Then into the whiplashes really fast. Goooooooood ride. Dont miss it. This ride reminds me of a Disney ride gone horribly wrong. In all seriousness this ride is an action packed ride with some nice airtime and great visual effects. The queue line and fire effects help make this ride shine. It has a well themed slow portion a couple of nice effects a high-speed backward coaster segments and two high-speed normal coaster segments. Together it makes a great not to miss attraction. Ahhh, I havent reviewed this yet. Alright - review time. First off, before I go into what I like about it, I just want to get into the things I dont like about it first. One would be a popular complaint - its length. However, its understandable considering the size of the building, I expected a short ride to begin with... so I wasnt overly disappointed due to the lack of surprise. The next and larger gripe would be the rides ending. First off ...wait, what ending? You dive down a steep drop with Imotep yelling "Death is only the BEGINNING!" and you think "awesome! more to go! "...what next? Well, before you know it Brendan Fraser is yelling about his Coffee (Ha-Ha - sarcasm) and youre lapbars are popping up. The ending is my main complaint, its just extremely weak and unsatisfying, and that includes the last bit of its coaster section. It feels like its merely an ending simply trying to get you back to the station while slowing the train down rather than trying to deliver any sort of thrill or conclusion. To me thats unfortunate, considering the drop that leads into it is extremely amazing and reunites the ride with crazy speed (for 2 seconds) - I guess it was just a room issue, oh well. Keep in mind, I do enjoy this ride tons nevertheless. I think its mainly the fault of whoever came up with this story. I just overall honestly dont like the concept, and thats why I cant slap it with a solid 9 or 10 - in addition to its rather lame ending. If only they would have thought of something more creepy and perhaps atmospheric than zooming around a "cursed" Mummy sequel set, and expanded its "slow dark ride" section to explore new locations, well, I would have been totally dazzled by it; but as it stands, its just not very imaginative - excluding its effects work. I just think more could of been done, alot more, but as it is I totally accept it. Its a very fun and unique ride with some great special effects and surprises, and the coaster section is extremely intense. Its a ride I do multiple times when going to Universal. Despite my gripes, its still gets awarded a sterdy 8 (I consider an 8 a very solid score). I do think some people may be overrating it, but thats just me. After hearing all the hype for this ride, I was very excited to ride it. I mean any ride that can combine amazing dark ride effects with a roller coaster has gotta be fun right? Well it turns out I was wrong as this ride doesnt do either of those things amazingly well. First off, although it was fun, the coaster portion of the ride was too short. The few seconds it lasted were a blast, but it definitely left me wanting more. Now for those of you who are saying that its not supposed to be a coaster, its a new hybrid dark ride/coaster. Well the dark ride portion frankly sucked in my mind. I mean the fire at the fake unload scene was pretty cool. 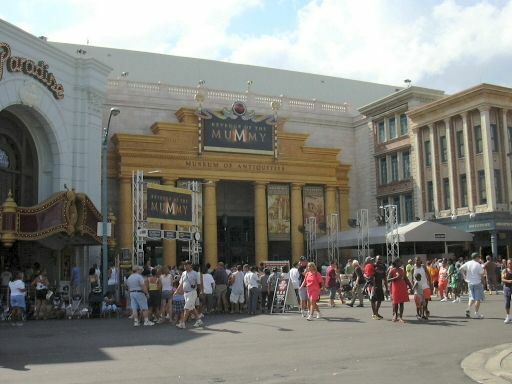 But the mummys just seemed overly fake, nothing more than a cheesy haunted mansion. I mean they popped up and that was it. It just seems that some people settle for too little, maybe Ive just been spoiled by better dark rides, but the first half of the mummy, while well decorated, was just ineffective. So the main problem was that this ride didnt do either thing well, it did two things at an average level so it gets an average rating. I was looking to be blown away...I wasnt. ROTM is a very very good ride, with top-notch theatrical special effects and some twists no one has ever seen before. More intense then any other Universal Studios ride, period. I wanted to love this ride, I didnt. I felt they had a great concept, but the execution was just slightly off. I have ALWAYS wanted to combine darkride / coaster. It was my "dream ride". First, let me say that the Mummy was a HORRIBLE choice. Why pick a movie in which the characters werent that great to begin with? Look at the other top themed rides Universal has: BTTF, Spiderman, Terminator. The Mummy doesnt come close to any of those stories and doesnt have any strong characters to keep you interested. If youre making a dark ride / coaster, you better have a good base to build from and The Mummy didnt have one. This sounds like a very negative review, but I DID like the ride a lot. I loved the "fake endings". I thought that was the selling point of this ride. Just when you think its over, it keeps going. Very clever and well done. I loved the coaster at the end as well...I had no problems with it. It was fairly intense and well made for this type of ride. Overall, I didnt like the dark ride aspect of the Mummy and that is what ultimately kicks 2 points off the score of this ride. As I mentioned earlier, the story was really lacking. It didnt "pull you into the ride". I feel the line for the ride has a lot to do with this. There wasnt enough pre-show aspects. You get thrown into it too fast. Revenge of the Mummy is surely an imaginative, fun, and thrilling ride. If youre at Universal Studios, you should put this near the top of your list of attractions to go see as it is a truly unique experience. Its great Unviersal got a little more "wild" and I hope this trend continues. Unbalievable Ride. This is one your definately going to want to go on. Its a roller coaster its a great movie ride, its got effects its got theming, and its got surprises around every corner. Good themeing and atmoshpere, but overall its a huge let down. Nothing really innovative special-effects-wise. The fire effect is cool but nothing blows your mind, and it is kind of short. I heard something called physcological thrill and I couldnt tell what it is after riding it. You basically wont fear nothing because those Mummies cant even move! Awesome ride. If you go to Universal, you have to ride this ride. The lauch up the hill was freaking spectacular. I wasnt quite sure whether to give this coaster a 9 or a 10, but every time I rode it, it got better. The theming and design is fantasic, as are the effects. My favorite part was probably the mini hulk-like launch, which suprised me the first time. Some of the animatronics are dissapointing, mostly the mummy warriors at the begginning and the beetles also werent convincing. But the rest is top notch. The ending dosent make much sense, as its not clear how the mummy is defeated. Hard to complain about the length, as they crammed a lot into a pre existing building, which put limatations on what they could do. This ride was awesome! You never knew what was gonna happen next. It is the best ride by far ar Universal Studios. I rode it 4 times and I noticed something new in the ride everytime. The theming was great.